Well Played, Box, Well Played. I found myself staring at the bottom side of a box. Having knife in hand, it was time to slit the strapping tape holding it together. It was going to be a box no longer. We do recycle here. We actually throw out less trash than we recycle, so Box, you will go out to the big green bin to the big green truck for it's trip to the recycling plant here. Box will join your friends, then roll down the block scaring my dog on its way. It's ok, you couldn't have know that the very food you contained would sustain the same dog you would eventually scare on your last trip off the island. He eats better than we do. You visited me only for a short time. Arriving crisp and clean, you sat in my dining room awaiting that Friday trip or a respite in a reuse. We do reuse before we recycle, but that wouldn't be your fate. Holding a bag of dog food was one thing that meant you would be too large, Box, for that sort of treatment. For a while you sat on my dining room chairs, the solid maple chairs that I brought from my old home in Philadelphia. You sat there empty looking over my dining room as if to ask what is my next step in life? You were in effect asking me, "when do I move on?". My dog Rack did sniff you over from tape to tip. After all, you smelled richly of Regional Red. We got him the best food we could simply because he wouldn't digest anything else. Dogs who don't digest don't get strong, they don't thrive. But for about two months, the bag of Orijen dog food that came from the plant in Canada, then to Petflow.com in New York will bring life to our beloved faithful sidekick. 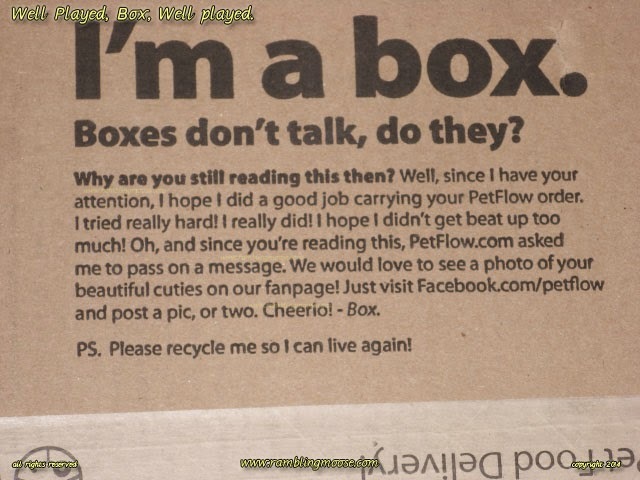 Box, if that is what you wish to be called, you will have another life. Perhaps as paper towels, perhaps as another box, perhaps as electricity. Tomorrow the food you brought us a month ago will be opened so my dog can sniff it over, and eat slowly all day. In another two months, Box, your great grandchild will visit us with another bag of imported dog food from the Great White North of Canada. I am advertising averse. I watch TV programs only with a remote and a DVR handy. When a commercial comes on, I either skip past it, or let the delay build up so I can skip later. But I caught myself looking at you. Those commercials were not entertaining, but I have to admit I found myself pondering this message. Once in a very rare while, even I pay attention.